Mechanical Engineering student Richard Yim, who started in the St. Paul’s GreenHouse program last fall and will be a GreenHouse Fellow in the spring term, won a total of $35,000 for his landmine defusing venture this week. Richard and his team – the Landmine Boys – are developing a robotic device that will defuse landmines without using TNT and without the need for people to do what typically is unsafe work. For example, if landmines in Cambodia could be neutralized in an automated way, people would not continue losing their lives or being wounded, and the land could be used for agriculture and other purposes. 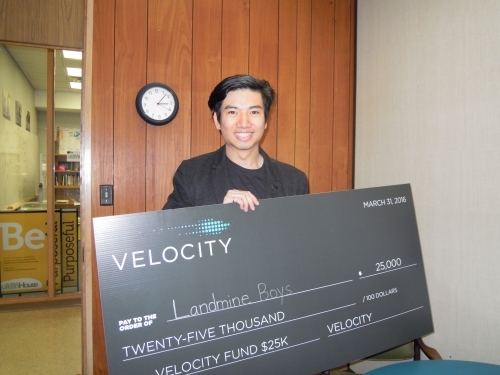 The big prize was $25,000 at the Velocity Fund pitch contest yesterday, and Richard also was one of six $10,000 winners at the Engineering Faculty’s Norman Esch Capstone Design pitch competition. Richard and the Landmine Boys came up with a prototype, and he took it to Cambodia in December to test it. The device worked successfully, and he was able to get the support of some local organizations. The Landmine Boys are now looking at the next stage of the venture – a second prototype and securing strategic partnerships in the landmine NGO community – and the new funding will support those endeavours. Richard also has the financial support of St. Paul’s Chancellor Lloyd Axworthy, well known for his support and leadership in landmine removal. Richard also won a GreenHouse Social Impact Fund Award last December, and a GreenHouse Fellowship at the Big Ideas Challenge for Social Good this March.